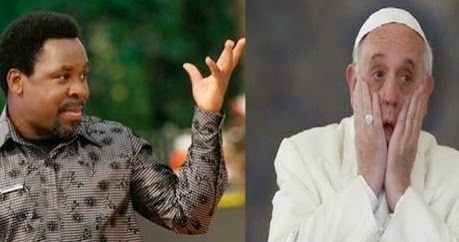 Prophet Temitope Balogun Joshua commonly referred to as T. B. Joshua, gave another surprising revelation in his church service on Sunday 7th August 2014, specifically calling for prayers for Pope Francis of the Catholic Church, as well as prophesying an imminent hijacking of a plane by ‘militants’. “There is a very big religious leader,” Joshua began, describing the said person as a ‘father’ figure, widely respected across different religions. “I have been praying for him,” he continued, adding that he received an alarming ‘vision’ concerning him the prior day. They should pray for him,” Joshua proceeded. “The clergyman I am talking about is the Pope,” he then clarified.